Crown Enterprises in Warren Confirms Sale of Detroit’s Michigan Central Depot to Ford Motor Co.
Matthew Moroun, chairman of Crown Enterprises Inc. in Warren, today announced that the company has completed the sale of Michigan Central Depot at Michigan Avenue and 14th Street west of Detroit’s Corktown district to an entity representing Ford Motor Co. The 505,000-square-foot depot has been vacant since 1988. “I would characterize the negotiations as respectful and they were not protracted in any way,” says Moroun, who worked with his father, Manual “Matty” Moroun, to preserve and update the building with a new service elevator, more than 1,000 windows, and electrical upgrades. “The due diligence of checking out the bones of the building and formulating plans took the vast majority of the time. 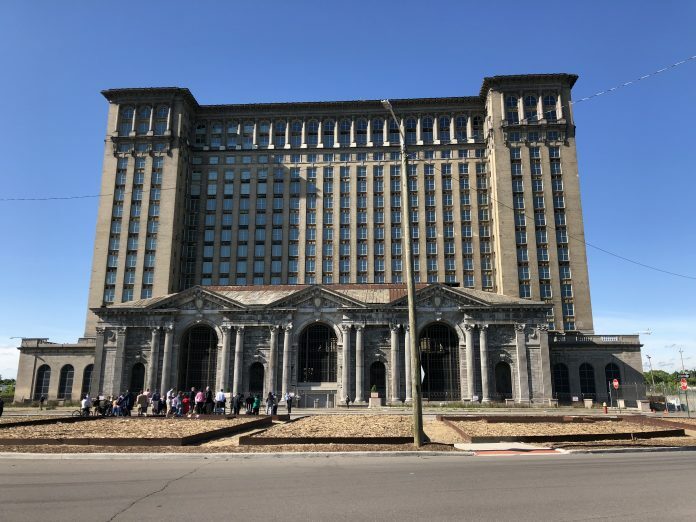 On Tuesday, June 19, Ford officials plan to announce plans for the depot and a neighboring building to the immediate east that was a former Detroit Public Schools book depository. Terms of the deal were not disclosed. While Ford officials have not disclosed their plans for the two structures, as well as several surrounding properties it has either acquired or has options on, the automaker will likely set up a 5G platform (fifth generation of network speed) as it prepares to set up a mobility campus in the immediate area. Using a state-of-the art communication platform, the automaker can better test connected and autonomous vehicle systems on a confined network of urban roads. Last week, Ford began moving around 220 employees into The Factory, a two-building, brick complex located the southwest corner of Rosa Parks Boulevard (12th Street) and Michigan Avenue. The buildings were previously owned by brothers Robbie and Tom Buhl, who had undertaken a renovation that was to include Buhl Sports Detroit and event space. Ford, which acquired the structures from the Buhl family last year, says the Corktown location is now home to Ford Team Edison, the company’s dedicated global electric vehicle team. The team is working to deliver electrified vehicles that offer enhanced capabilities, including an all-new Mustang-inspired battery-electric SUV slated for 2020. Working alongside Ford Team Edison will be the company’s autonomous vehicle business team, which is combining its self-driving vehicle expertise with the robotics and artificial intelligence experience of Argo AI. With its autonomous and electric vehicle teams working side-by-side, the company plans to develop a purpose-built, custom-designed self-driving vehicle that runs on a hybrid-electric powertrain. Planned to begin production in 2021, Ford’s first autonomous vehicles that will allow businesses to enhance and grow their operations, as well as provide intuitive experiences to the customers they interact with. During his address, Moroun thanked Tom Buhl for introducing him to the Ford team. The Buhl family is one of the oldest families in Detroit. In 1833, Christian Henry Buhl arrived in Detroit from Pennsylvania and almost immediately started up a hat company. His brother, Frederick Buhl, joined the operation soon after and the pair expanded their product line by adding furs, and later, silk. Later in their lives, the siblings were the only brothers to each serve as mayor — Frederick in 1848, and Christian in 1860 and 1861. After retiring from the business in 1855, Christian joined forces with Charles DuCharme to start a wholesale hardware business. The Buhl brothers had interests in multiple businesses, including Sharon Iron Works, Detroit Locomotive Works, Buhl Iron Works, Buhl Stamping Co., several railroads, Michigan State Bank, Detroit National Bank, Detroit Copper and Brass Co., Sprocket Chain Manufacturing Co., Buhl Malleable Co., and Peninsular Car Co.